Unfortunately, there may come a time in our beloved pets' lives, where the only humane solution for their suffering is to gently put them down. At our animal hospital, we know how difficult that decision and process can be, which is why we provide Pet Euthanasia service with as much caring and compassion as humanly possible. Some people feel it will be easier for their pet to pass away at home amid familiar surroundings. 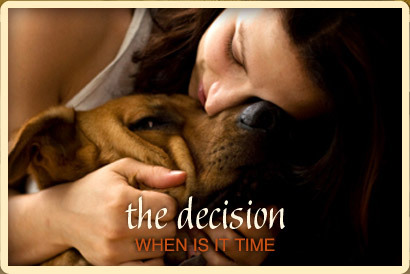 Our in-home pet euthanasia is a service we can provide for our established clients. We honestly hope that it's a decision you never have to face, but please know that we are here for you and your pet if you ever need us. Children have special relationships with their pets. Excluding or protecting children from this decision-making process, because they are thought to be too young to understand, may only complicate their grieving. Children respect straightforward, truthful, and simple answers. If they are prepared adequately, children usually can accept a pet's death. The act of saying goodbye is an important step in managing the natural and healthy feelings of grief, sorrow, and sense of loss. Your pet is an important part of your life, and it is natural to feel you are losing a friend--for you are. Anger may follow denial. This anger can be directed toward people you normally love and respect, including your family and veterinarian. People will often say things that they do not mean, perhaps hurting those whom they do not mean to hurt. You may blame yourself or others for not recognizing the illness earlier or for being careless and allowing the pet to be injured. Although the signs of grief apply whether the loss is of a loving pet or a human loved one, grieving is a personal process. Some people take longer than others to come to terms with denial, anger, guilt, or depression. If you understand that these are normal reactions, you will be better prepared to cope with your feelings and to help others face theirs. Family members should be reassured that sorrow and grief are normal, natural responses to death. For telephone support call 540-231-8038. If you or a family member has great difficulty in accepting your pet's death and cannot resolve feelings of grief and sorrow, you may want to discuss those feelings with a person who is trained to understand the grieving process such as a grief counselor, clergyman, social worker, physician, or psychologist. Your veterinarian certainly understands the loving relationship you have lost and may be able to direct you to community resources, such as a pet-loss support group or hotline. Talking about your loss will often help. The death of a pet can upset you emotionally, especially when euthanasia is involved. Some people may feel they would never want another pet. A new pet may help others get over the loss more quickly. Just as grief is a personal experience, the decision of when, if ever, to bring a new pet into your home is also a personal one. If a family member is having difficulty accepting the pet's death, bringing a new pet into the home before that individual has resolved his or her grief may imply that the life of the deceased pet was unworthy of the grief that is still being felt. Family members should come to an agreement on the appropriate time to acquire a new pet. Although you can never replace the pet you lost, you could get another one to share your life.